Meet the Most Famous Singing Gringo in East L.A. It had been half an hour since Mateo finished singing at a Mexican restaurant in East Los Angeles, and customers were still chatting about him. "We were just saying we should hire him for a party," says Alfonso Garcia, 29, an airport worker having lunch with his girlfriend. "That was the first time I've ever seen anything like that." Garcia was impressed that Mateo sang old bolero songs  a form of slow-tempo, romantic Latin music  in fluent Spanish with a soft, delicate voice. What impressed him even more was that Mateo's real name is Matthew Stoneman and he's a 47-year-old New Hampshire native with red-orange hair and pale skin. The stark physical contrast between Stoneman and the Mexican mariachi bands he competes with for business in Hispanic East L.A. has earned him fame around here. "It's pretty thrilling to walk in and people think, 'What's this guy going to play, John Denver?' " he says. As Mateo, he has gained local media attention; he's the star of a documentary in progress; and he gets perks like free food and shoe shines from shop owners. But in interviews, Stoneman prefers to focus on his music rather than the fact that he's a white man playing Latino music, which he calls a "gimmick." And it's true: there's much more to Stoneman's story than first meets the eye. State prison helped make Stoneman the man he is today. A pianist, he had moved to Los Angeles in 1983 and aimed for fame with music he composed in the style of Elton John. When that didn't work out, he bought a studio that produced rap. He got behind on his payments, so he hooked up with a group of criminals from Sinaloa, Mexico, to rob a music store. "I used to be real scandalous," he says. He pawned the equipment from the store to pay for his studio, which gave the cops a lead to track him down. In a futile attempt to escape, Stoneman jumped off a 20-ft. (6 m) ledge onto a freeway, breaking both ankles, one leg, one arm and his back. He served 4½ years and learned his lesson. In jail Stoneman wrote songs and performed in Spanish for the inmates. When he got out, he started busking on the streets and dubbed himself El Gringo Mariachi, even though he doesn't play mariachi music. Now he prefers Mateo, which is Spanish for Matthew. Ten years later, Stoneman is relentless. On a recent morning, he stopped by a McDonald's in Boyle Heights to play "Las Mañanitas," the Mexican version of "Happy Birthday," for an employee. While there, a man delivering bread recognized him and asked for his number. Next, he stopped by a home for the elderly to play a half-hour set for two dozen seniors who sang along. "At first we didn't think he would know Spanish," Maria Quintal, a volunteer worker, said as Stoneman played "Solamente Una Vez," by the Mexican singer Agustin Lara. "Now they ask for him." Lunchtime brought him to La Parrilla restaurant, where Stoneman played for customers next to a tip basket. Dinnertime often means the same routine, or he'll be hired for a wedding, birthday party or funeral. Sometimes Stoneman stays out until the middle of the night if he's hired to do a traditional serenade outside a girlfriend's or grandmother's window. "The typical Mexican voice is very big. That's how they get their emotion," Stoneman says. "I do it very softly." Stoneman lives a thrifty life in L.A. He buys the cheapest cars he can find, driving them hard from gig to gig until their engines die. (He bought his current ride, a 1989 Toyota Tercel, for $500 on Craigslist.) He does this because he's always saving his money to record music in Cuba. 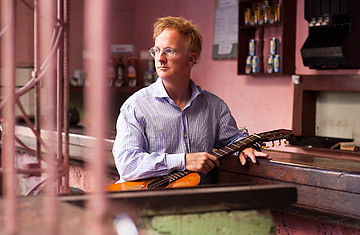 In prison, Stoneman saw Buena Vista Social Club, the Academy Awardnominated documentary about traditional Cuban musicians, and became determined to record with them. He succeeded with his 2005 album, simply titled Mateo, which features songs he wrote in bolero style. Orlando "Cachaito" Lopez, the now deceased Buena Vista Social Club bassist, plays on the record. Stoneman's next album will be released this summer. Still, it's not always easy for Stoneman to make a living in L.A. He says some of the mariachi players don't take kindly to him. "They feel like he's taking away their business," says Mary Carmen Salas, owner of La Parrilla. Aaron Naar, director of the film Mateo, says he's seen people push Stoneman. "He'll shake it off and go sing in the corner. He's got to make a buck," says Naar, who followed Stoneman around for a year to make the documentary, set for release late this year. "You get this sense that people laugh at him for the way he looks or the way he's singing." So why does he sing in Spanish in East L.A.? Why Cuba? "He said to me one day, 'All I want is a legacy,' " Naar says. When spending time with him, this becomes apparent. Stoneman puts every ounce of his energy toward getting his big break. "I'm really trying to do something special," he says. "I want to be like Nat King Cole. That's what I want." See the best cartoons of the week.